Over the last two years, Envira has become the most powerful WordPress gallery plugin in the market. There are dozens of addons that allow you to do everything from watermarking, image proofing, to automatically creating galleries straight from Adobe Lightroom. As we continue to grow and add more features which we know you want, we have been listening to your feedback on usability and flexibility. 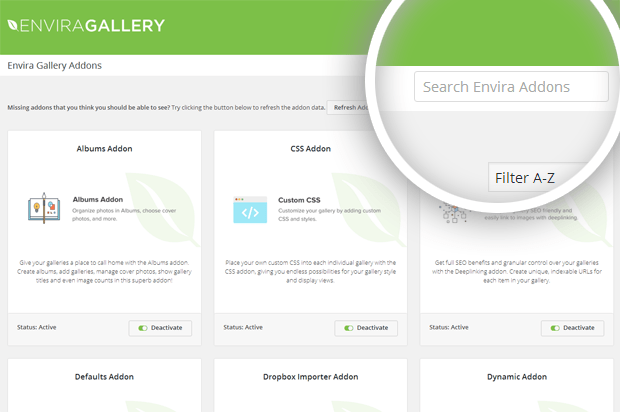 We’ve spent countless hours working directly with customers, and we are thrilled to announce a significant improvement to the Envira Gallery workflow as a result. In a nutshell: we redesigned the gallery creation process to make it easy for new users to get started while allowing our team to continue to add new features that we know you want. It all starts with the first decision in the process. 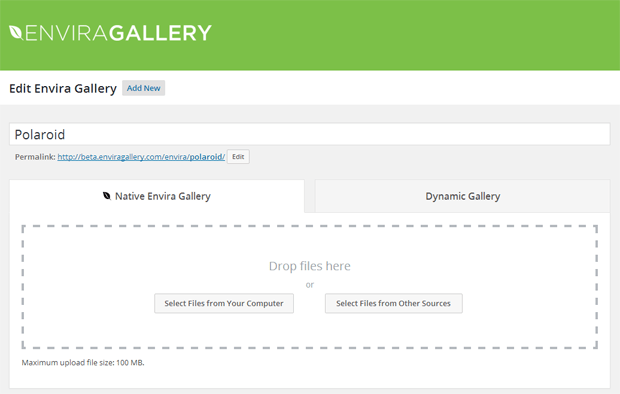 Do you want to create a Native Envira Gallery or create a dynamic gallery from third-party sources like Instagram. In the future, this will allow us to add new gallery sources such as Flickr, 500px, and numerous others that many of you have asked for. Next, we switched from horizontal tabs to vertical tabs. As we added more features and add-ons, it simply wasn’t sustainable to keep the horizontal menu layout. By using this new style, you can have all the add-ons activated without compromising the user experience. 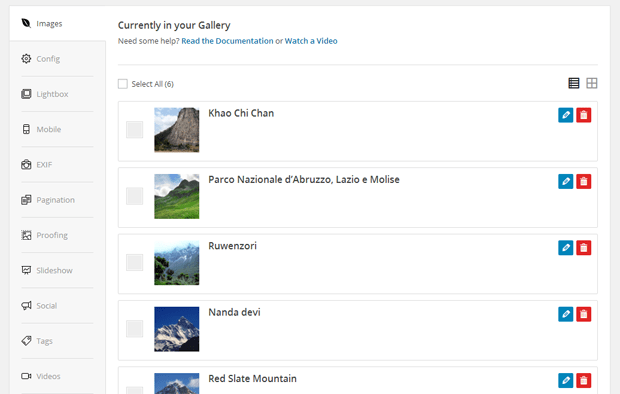 We also added the ability to switch between grid and list view when creating new galleries. This is going to be extremely helpful when you have a lot of images in your gallery. As we add more addons, it was becoming increasingly harder for new users to find what they were looking for. In the new addons screen, you can now search for addons, filter them, and install / activate them all from the same screen. Think of this as a mini-Envira app store. This is going to be extremely helpful as we will be adding at least a dozen new addons before the end of this year. The new workflow is being rolled out for our Pro users. In the next 2 weeks, we will launch this new workflow on the Lite version as well. We have 3 new addons that will be released in the near future including Featured Content Addon, Breadcrumbs Addon, the much requested Downloads addon, and a surprise addon that I know you will love. 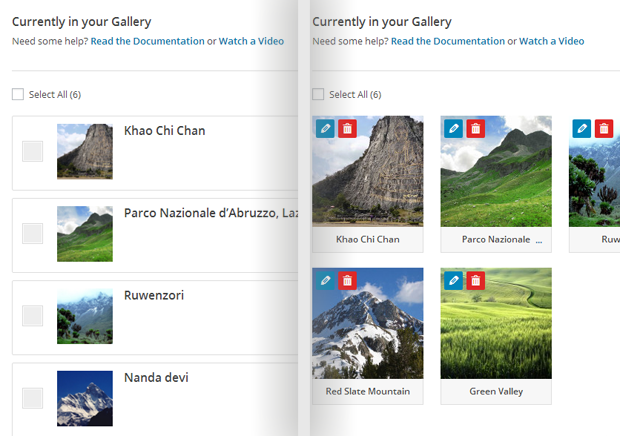 With this update, am I able to create a gallery that’s linked to a specific Dropbox folder, and is automatically updated as I add photos to that folder? not seeing the update, and when are you going to build in a slider option, or should I buy another plugin to do that ! Envira Gallery needs to have the ability to move photos to another gallery like NextGen has. Thanks for the suggestion – we’ll be adding this to our next release. hello, what I would like to do is to create a shortcode over the image displayed in the gallery, as a caption, title or somehow, linking to my product cart through Easy Digital Downloads. Can I do that with the premium plug-in? Hi Sergio 🙂 You can add a caption to your gallery images that has a link to the EDD single product page. But you’d only be able to show the link in the lightbox. Or you could link the gallery image directly to the EDD single product page instead of having the lightbox open. We have a demo of the first option (using Woocommerce but it’s the same concept for EDD): https://demo.enviragallery.com/envira/enviras-woocommerce-automatic-demo-linking-to-single-product-page/. Click any image on that page to open the lightbox – you’ll see the View More Details button (it’s a caption that links with CSS styling for the button) and it will direct the user to the product page. Does that help?